The grid below provides a summary of some of the key characteristics of Churches, denominations, sects and cults. As with any ‘scheme of categorisation’, many real-world examples of organisations will not fit exactly into every row. For example, some sects may appeal exclusively to white people, and some may have middle class members. 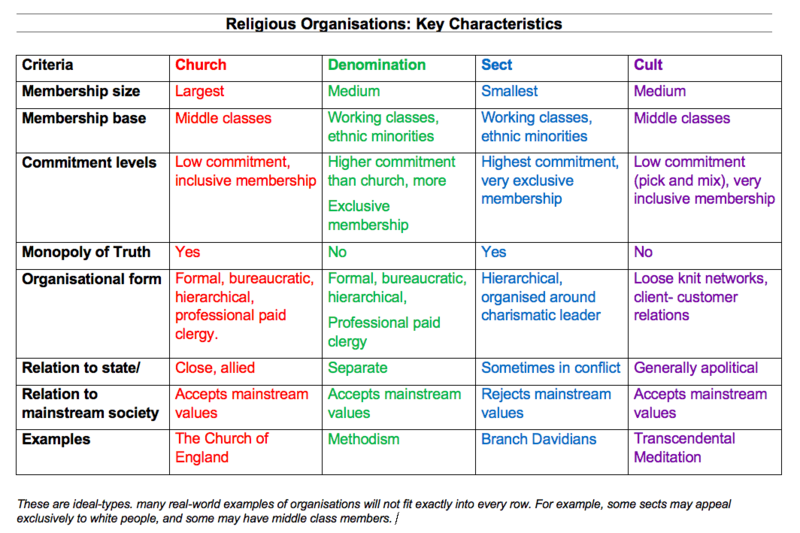 Hence these are ideal-types, and you might like to keep in mind that they are of limited use, and just a general, ‘starting point’ guideline for helping to understand the incredible diversity of religious organisations. seven mind maps covering the sociological perspectives on beliefs in society. In colour! The content focuses on the AQA A-level sociology specification. All at a bargain price of just £1.99!